Out of warranty? Give your Audi the care that only an Audi Certified Technician can deliver. We wanted you to know that no matter how many kilometres you've covered, our love for your vehicle is unconditional. Only Audi Master Technicians have more than 400 hours of Audi-specific training under their belts. Let us give your Audi the care it deserves. Get Audi 24-hour Roadside Assistance with our compliments! 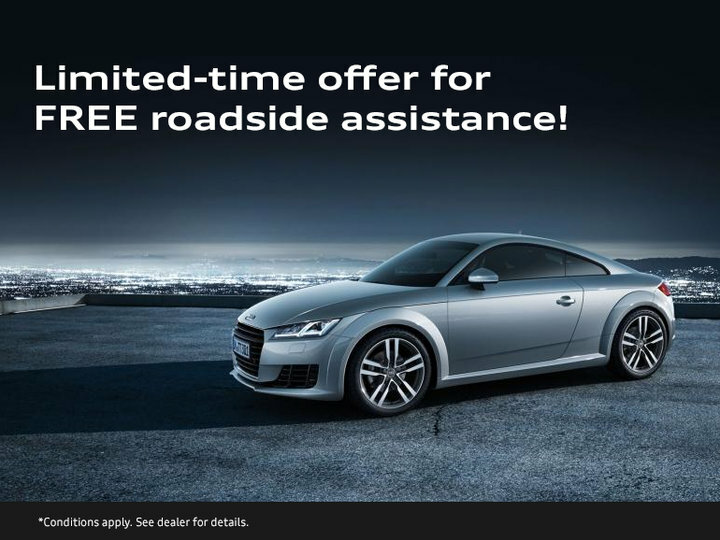 Book an appointment for one of the following services before December 1 5, 2019, and you'll receive 12 months of Audi 24-hour Roadside Assistance with our compliments. No cost, no catch. Just a little encouragement to help you get the maximum enjoyment from your Audi for years to come. Brake Fluid Flush: Replacement of brake fluid and comprehensive check of brake pads and discs. Timing Belt Replacement: Preventive replacement to avoid more serious damage to engine and components. Next scheduled vehicle maintenance: Comprehensive c heck-up of brakes, engine oil, cooling system, and more. Act now to take advantage of this offer. Combining a team of qualified customer service professionals with a comprehensive nationwide towing network, the Audi 24-Hour Roadside Assistance program prepares you for the unexpected. Offer available only to out of warranty customers. Roadside Assistance provided by Club Auto Roadside Assistance. Offer cannot be redeemed for cash and is subject to change without notice. Available on select services only. Valid until December 15, 2019. **Applicable taxes are extra. ©2019 Audi Canada. "Audi, "'Vorsprung durch Technik" and the four rings emblem are registered trademarks of Audi AG. Audi Canada, 777 Bayly Street West, Ajax, Ontario L1S 7G7, 1-800-822-AUDI.